When two creatives like Ana Hernández and Christophe Penasse, the founders of the Masquespacio design studio, decide to design products that correspond to their idea of living in space, the impact is guaranteed. Over the last 8 years since the creative design studio, Masquespacio, was established, they have crafted a great number of interior design projects around Europe, from Valencia, where they are based, to Norway (Veritas), and Germany (La Solera), winning numerous awards along the way and now the time has come for Ana Hernández and Christophe Penasse to take up new challenges. The result is Mas Creations, a lifestyle brand that turns the creative pair's ideas of contemporary living into design objects for different uses - from leisure time to retail spaces. Their first creation is a seat, a stool actually with a post-industrial feel: Doctor Workshop. 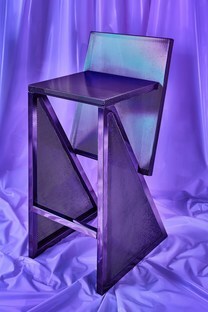 The name wasn't chosen by random because the stool was part of the interior design project by Masquespacio, called Doctor Manzana, the first shop, in the territory, of the brand that repairs mobile devices. At the time, Masquespacio had designed the interiors of the shop, as well as the brand's visual identity, on a tight budget, using galvanised steel for the walls to avoid demolishing and rebuilding them. Made from perforated metal, Doctor Workshop was inspired by the Vilbert chair designed in 1993-94 by Verner Panton for Ikea. Whereas the chair by the Danish designer consisted of four MDF panels screwed together, available in two different colours, Doctor Workshop has a decidedly more contemporary spirit.